All the flavors of King Ranch Casserole in soup form. Rotisserie chicken (or leftover turkey), cream of chicken, cream of mushroom, Rotel tomatoes, spices, College Inn chicken broth, Velveeta and tortillas. Ready in under 30 minutes. Can also make in slow cooker. In a Dutch Oven, whisk together cream of chicken soup, cream of mushroom soup and chicken broth. Stir in Rotel tomatoes, onion powder, garlic powder, chili powder, cumin and chicken. Bring to a boil. Reduce heat to low, stir in Velveeta. 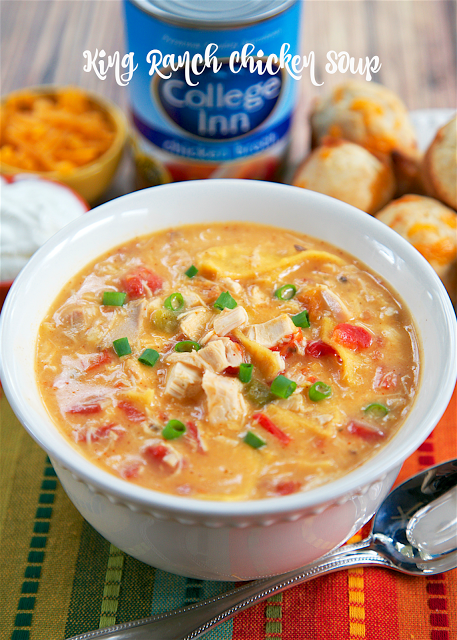 Visit King Ranch Chicken Soup @ plainchicken.com for full instructions.